Rookery Farm Norfolk01263 821232work01263 822242fax Self-cateringExceptional accommodation in seven beautiful modern barn conversions set round a garden courtyard, each with its own private patio, lawn and herb garden and plenty of parking. The barn interiors are chic and contemporary - equipped for easy living and year round comfort. Rookery Farm can provide versatile accommodation with two cottages all on one level, one sleeping 4 the other 6. Three more properties offer some ground floor bedrooms (with adjacent bathroom/wet room) sleeping 6, 8 and 14 people. Two cottages, sleeping 6 and 2 respectively, have only upstairs bedrooms. Rookery Farm is tucked away but perfectly placed for all that's good about beautiful North Norfolk with the coast only 2.5 miles distant, rolling countryside and charming towns and villages within easy reach. Within easy walking distance are two village pubs. The farm can be enjoyed by all; fields are surrounded by wide grass margins some allowing 'permissive access' for walkers and dogs on leads whilst others are reserved for wildlife habitats. We want you to feel relaxed and comfortable the minute you arrive - there'll be tea and homemade cake ready and waiting. 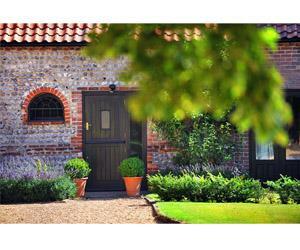 Rookery Farm Norfolk offers weekly bookings starting on Friday and Saturday. 3 first floor bedrooms, 1 double and 2 twin, cot and highchair available. Linen, house towels (not beach towels), fuel, logs, heating and power, Wifi - all included. Pets by arrangement. Chaff House offers weekly bookings starting on Friday. 7 bedrooms sleeping 14 people, 2 cots/high chairs available. 3 doubles and 4 twins or 4 doubles and 3 twins. Linen, house towels (not beach towels), fuel, logs, power and heating included. Pets by arrangement. Long Barn offers weekly bookings starting on Friday. 4 bedrooms sleeping 8 people, cots and high chair available. 2 double and 2 twin or 3 double and 1 twin. Linen, fuel, logs, power and heating included. Pets by arrangement. House towels provided (not beach towels). Workshop offers weekly bookings starting on Friday. Exceptional accommodation in seven beautiful modern barn conversions set round a garden courtyard, each with its own private patio, lawn and herb garden and plenty of parking. The barn interiors are chic and contemporary - equipped for easy living and year round comfort. Rookery Farm can provide versatile accommodation with two cottages all on one level, one sleeping 4 the other 6. Three more properties offer some ground floor bedrooms (with adjacent bathroom/wet room) sleeping 6, 8 and 14 people. Two cottages, sleeping 6 and 2 respectively, have only upstairs bedrooms. Outstanding luxury self-catering accommodation in seven beautiful modern barn conversions, most with ground floor bedrooms and wet rooms. The flexible accommodation will suit all - from couples to multi-generational family celebrations or friends reunited. Non smoking establishment Swimming pool - nearby Caravan Site (max 5 pitches) - chemical toilet disposal facilities and electric hook up supply to touring vans Children welcome from any age. One mile south of the A148, midway between Holt and Cromer. From Sheringham - 2.5 miles Bus or taxi rank adjacent to station.